EMTEX STUDIO is specialized in audio post production. EMTEX STUDIO has an international reputation for its audio postproduction services. Whether the jobs are for theater, television, web, music production or other physical mediums, EMTEX STUDIO lets you benefit for reasonable fares of its experience in audio production to deliver you a master adapted to the broadcast’s needs. – Pro tools 10 and 11 digital audio workstations. – RME Fireface 802 audio interface (60 I/O). 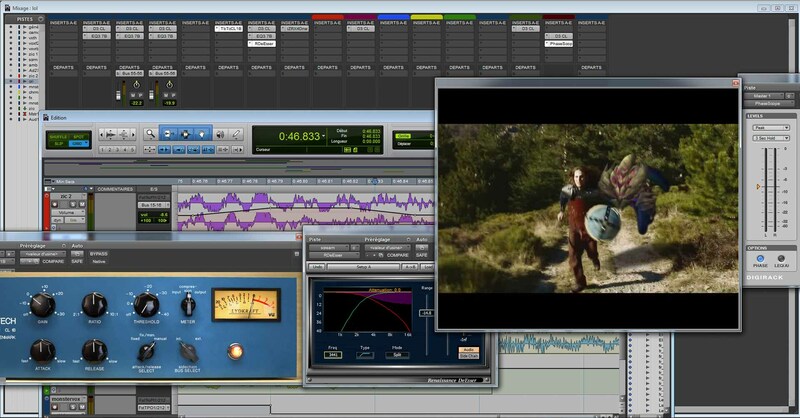 – Multiple studio environment monitoring to check mix in different conditions. – Beyerdynamic DT 770 pro 250 ohms headphones. – Rack effects and multiple pre-amplifiers (RME, SQN, SPL…). – PC Windows 7 pro 64 bits, CPU i7 4hearts @ 4.8 GHz, RAM: 16Go 1TO SSD, 9TO HDD, Nvidia GeForce GTX 550 Ti graphic card.